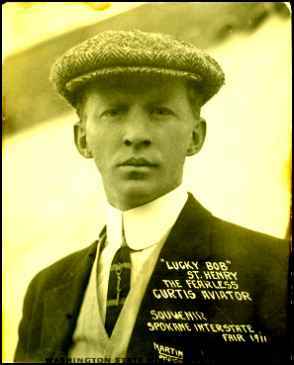 Castle W. Shaffer was an early American Aviation Barnstormer known as "Lucky Bob" St. Henry. He was born in Sutton Clay County, Nebraska January 28, 1882 and served a machinist apprenticeship with the Union Pacific Railroad shortly after his high school graduation in 1898. Upon completion of his high school education he went to work for David Buick in Detroit, Michigan and helped David develop an engine to go in a horse driven buggy. The company went on to become the Buick Motor Car Company. Castle would take the motor driven car that he helped David Buick develop to various Up-Scale department stores and demonstrate a motor driven carriage. One of his stops was the May Company in Cleveland, Ohio and this is where he met my grandmother who was working at the May Company at the time. He returned to Detroit and he and my grandmother were married. They had one son who they named Carl W. St. Henry Sr. and they had seven children to whom they named the first born Robert St. Henry after my father's name Lucky Bob St. Henry aka Castle W. Shaffer. The marriage did not work out and Castle left my grandmother and went back to Nebraska. While with the Buick Motor Car Company, Castle Shaffer traveled all around the country, racing the early cars that incorporated the David Buick engine. He became well known as an early race car driver. When he returned to Nebraska, he was contacted by Glenn Curtiss to see if he would be interested in flying early biplanes with the Curtiss camp in the western part of the country. He became very well known flying these early biplanes at various fairs throughout the western United States and Canada. He got the name "Lucky Bob" because he was lucky to live through many close calls while flying in these fair attractions. He outlived most of his peers who were eventually killed while flying the early planes. He eventually married in November 1915 and had one daughter, Kay McCumber, who has written several articles about her father's early pioneering days. Lucky Bob died March 28, 1954 at the age of 70 from a stroke. There is a dark side of the life of Lucky Bob and that was his wife and son in Michigan. His son never knew his father. His son died in 1968.